Kepler mission – It’s full of stars! Here’s what you have been waiting for, NASA Kepler’s full field of view – an expansive star-rich patch of sky in the constellations Cygnus and Lyra stretching across 100 square degrees, or the equivalent of two side-by-side dips of the Big Dipper. Yes, we have been spending a lot of time viewing the parade of stars, and galaxies and other interesting astrophysical and instrumental features for the past week. First Light Fever struck us hard. We’ve managed to do a lot of serious work all the while walking on air with these data. 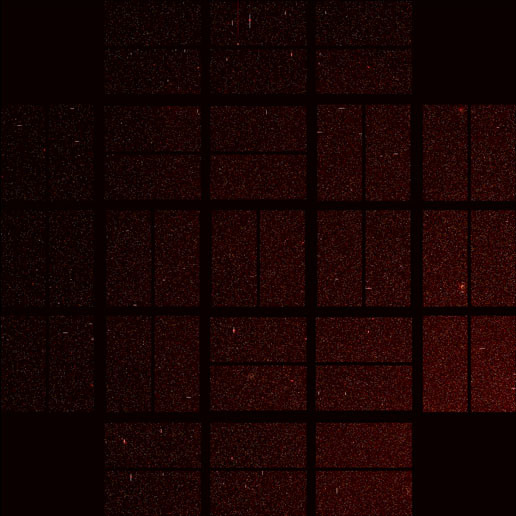 These first light images allowed us to test our pixel-level calibrations out for the first time on a real star field, and for the first time on orbit. We also can examine the shape of the star images and finally, finally know what the relative orientations among the 42 CCDs are to well under a pixel (27 microns). This could not be done before we got into space. I’m tickled pink with the results, and I’m sure you will be, too! The images we look at are the result of rendering a gray-scale digital image file onto a monitor and choosing a colormap and scaling scheme. It’s quite similar to how ordinary digital cameras work, the CCD sensors respond to the light falling on them, generating a voltage in each pixel that is proportional to the number of photons that struck the pixel region during the exposure. The CCD is read out and the voltage is digitized by an Analog to Digital (A/D) converter and stored in memory as a sequence of numbers. The difference between Kepler and an ordinary camera is that Kepler does not convert the image data into a common image format such as JPEG or TIFF, as that can degrade the quantitative information in the image, and Kepler doesn’t have a USB cable to download the images to our computer, it sends the data over a radio link to the Deep Space Network who route the data to our Mission Operations Center (at LASP in Boulder, Colorado), who send the data to our Data Management Center (our permanent archive at the Space Telescope Science Institute in Baltimore, Maryland), who kindly format the data into a common astronomical image format (FITS) and send it here to the Science Operations Center located at NASA Ames Research Center. I can read in the FITS file and display it on my computer the same way you look at images you’ve snapped with a digital camera and downloaded to iPhoto or other picture album program. The mosaic you will find on the Kepler web site is quite big, about 12000×12000, and I need to use a linux workstation with 8 GB of memory to manipulate it in full resolution with no compression. Actually, I did sit in a dark room the first time I saw the images — they came in the evening of the 8th and I was getting my 2 1/2 year old son to bed, so I sat on the floor next to the bed while he drifted off to sleep zooming in and out and panning through the first raw image to see what was what. Several of us, including Natalie Batalha, were actually on base or close enough to come into the office and look at the images — I dialed in to the speaker phone to join in the fun of calling out interesting items to share with other Science Office personnel who, like me, couldn’t wait until the next work day to take a peek. We were, and still are, in a state of wonder and enchantment over the images and the promise they hold for us to find Earth-like planets. We’d better be happy, too, since we’re going to be staring at the same scene for the next 3.5+ years! Words fail me; the images speak for themselves! Dr. Jill Tarter of the SETI Institute (my home institution) is a member of the Kepler Science Working Group and has a particular interest in following up our discoveries to inform a targeted SETI search of stars with terrestrial planets. The SETI Institute has been carrying out radio searches for years at radio observatories like Arecibo and Greenbank. We are also building the Paul Allen Telescope Array which will have exquisite spatial resolution and sensitivity to follow up on Kepler discoveries. Check out www.seti.org for more information. Für den Verwendung eines Lammfellsattels gibt es keine geradlinigen Beschränkungen, deshalb ist er alles in allem für alle Pferderassen geeignet. Da es Fellsättel in unähnlichsten Abwandlungn gibt, kann er gleichermaßen reibungslos beim mickrigen Pony eingesetzt werden. Es ist hingegen dennoch aussichtsreich, die ungleichen Type der Fertiger beieinander zu vergleichen. So bieten die Hersteller Christ wie Eclipse einen angenähten D-Ring für die Aufhängung der Steigbügel an, wenngleich bei bspw. Grandeur die Steigbügel aufgeklettet werden. Stoopid – answered already ! I guess the lines are “blooming” from very bright stars. When a CCD pixel receives more photons, and hence produces more electrons, than it can store, this extra signal overflows in neighboring pixels of the same column (Notice the lines occur along the smaller dimension of each CCD). So, you often see those around very bright objects in astrophotos. You don’t see them in digicam photos because these have CCDs with antiblooming gates (think of an overfill drain at each pixel), which has the drawback of adding complexity to the device, reducing the photodiode (sensitive) area and hence the CCD’s sensitivity, capacity and signal-to-noise ratio. On the full image (http://kepler.nasa.gov/about/1stlight/ffi.html) there are lots of white lines that are perfectly horizontal or vertical. What are these?